Do you have any friends from your past who are now famous? My wife, being a graduate of NYU, has known people who have been on Broadway and on television, but no breakout stars. Her younger brother was good friends with Tony An from H.O.T. (“Hi-Five of Teenager” — such an awesome name) back in junior high. In fact, my wife once showed a picture of her brother and Tony together (with a couple of other friends) to a youth group student who immediately began crying. Once, when I was in college, I saw a pre-teen Bam Margera come ripping through one of our skateboarding sessions. I have an old 411 VHS tape to prove it. If you watch Bam’s sequence closely (which he nailed in one take — quite a prodigy, he was!) you can see my feet as I’m seated on a low wall nearby. Well, in any case, in an issue of Spin from awhile ago I stumbled across some folks I knew from back in high school. I knew that they had been involved in bands from back then, but I had no idea what they were up to until I saw their names listed as Spin’s Artist of the Month — eventually they went on to become Spin’s underground band of the year for 2006. 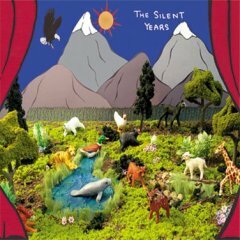 Their band is named “The Silent Years” and they are well worth checking out. In fact, you can find four amazing tracks for free over at Daytrotter. Their eclectic indie rock sound will appeal to people with a wide variety of taste — not because they’re trying to appeal to everyone in a gross “muzak for all peoples” lowest common denominator kind of way, but because their voice is fresh and they do what they do extremely well. Has it really been twenty years since the sprawling noise epic You’re Living All Over Me was released? And yet, here we are, with Dinosaur Jr. recently reunited (with plenty of corny “Dinosaur Sr.” jokes, I’m sure) and with a brand new album, Beyond. I’ll probably write a more detailed review later, but I was pleasantly surprised by this album. It’s much more than a one-off, Bands Reunited nostalgia trip. J Mascis still peddle-hops his way through solos that, while not necessarily melting off the faces of listeners, threaten to careen off the edge of a cliff before eventually wandering back home. The dance party our family had to this album’s opening tracks testifies to the potency of Lou and Murph’s urgent rhythm section. My daughter likes “Almost Ready” in particular.